The Erbil Citadel, locally called Qalat (Kurdish: قەڵای ھەولێر‎ Qelay Hewlêr; Arabic: قلعة أربيل‎) is a tell or occupied mound, and the historical city centre of Erbil in the Kurdistan Region of Iraq. The citadel has been inscribed on the World Heritage List since 21 June 2014. The earliest evidence for occupation of the citadel mound dates to the 5th millennium BC, and possibly earlier. It appears for the first time in historical sources in the Ebla tablets around 2,300 BC, and gained particular importance during the Neo-Assyrian period. During the Sassanian period and the Abbasid Caliphate, Erbil was an important centre for Christianity. After the Mongols captured the citadel in 1258, the importance of Erbil declined. During the 20th century, the urban structure was significantly modified, as a result of which a number of houses and public buildings were destroyed. In 2007, the High Commission for Erbil Citadel Revitalization (HCECR) was established to oversee the restoration of the citadel. In the same year, all inhabitants, except one family, were evicted from the citadel as part of a large restoration project. Since then, archaeological research and restoration works have been carried out at and around the tell by various international teams and in cooperation with local specialists. The government plans to have 50 families live in the citadel once it is renovated. The buildings on top of the tell stretch over a roughly oval area of 430 by 340 metres (1,410 ft × 1,120 ft) occupying 102,000 square metres (1,100,000 sq ft). The only religious structure that currently survives is the Mulla Afandi Mosque. The mound rises between 25 and 32 metres (82 and 105 ft) from the surrounding plain. When it was fully occupied, the citadel was divided in three districts or mahallas: from east to west the Serai, the Takya and the Topkhana. The Serai was occupied by notable families; the Takya district was named after the homes of dervishes, which are called takyas; and the Topkhana district housed craftsmen and farmers. The site of the citadel may have been occupied as early as the Neolithic period, as pottery fragments possibly dating to that period have been found on the slopes of the mound. Clear evidence for occupation comes from the Chalcolithic period, with sherds resembling pottery of the Ubaid and Uruk periods in the Jazira and southeastern Turkey, respectively. Given this evidence for early occupation, the citadel has been called the oldest continuously occupied site in the world. Erbil appears for the first time in literary sources around 2300 BC in the archives of Ebla. According to Giovanni Pettinato, it is mentioned in two tablets as Irbilum. Later, Erridupizir, king of Gutium, captured the city in 2200 BC. At the end of the 3rd millennium BC, Erbil is mentioned in historical records of the Ur III period as Urbilum. King Shulgi destroyed Urbilum in his 43rd regnal year, and during the reign of his successor Amar-Sin, Urbilum was incorporated into the Ur III state. In the 18th century BC, Erbil appears in a list of cities that were conquered by Shamshi-Adad of Upper Mesopotamia and Dadusha of Eshnunna during their campaign against the land of Qabra. Shamshi-Adad installed garrisons in all the cities of the land of Urbil. During the 2nd millennium BC, Erbil was incorporated into Assyria. Erbil served as a point of departure for military campaigns toward the east. Erbil was an important city during the Neo-Assyrian period. The city took part in the great revolt against Shamshi-Adad V that broke out over the succession of Shalmaneser III. During the Neo-Assyrian period, the name of the city was written as Arbi-Ilu, meaning 'Four Gods'. Erbil was an important religious centre that was compared with cities such as Babylon and Assur. Its goddess Ishtar of Erbil was one of the principal deities of Assyria, often named together with Ishtar of Nineveh. Her sanctuary was repaired by the kings Shalmaneser I, Esarhaddon and Assurbanipal. Inscriptions from Assurbanipal record oracular dreams inspired by Ishtar of Erbil. Assurbanipal probably held court in Erbil during part of his reign and received there envoys from Rusa II of Urartu after the defeat of the Elamite ruler Teumman. After the end of the Assyrian Empire, Erbil was first controlled by the Medes and then incorporated into the Achaemenid Empire before it became part of the empire of Alexander the Great after the Battle of Gaugamela, which was fought near Erbil in 331 BC. Subsequently, after the partition of Alexander the Great Empire by his generals (known as Diadochoi), the city was called Arabella or Arbela and it was part of the Hellenistic Seleucid Kingdom. After the 1st c. BCE, the Roman and Parthian Empire fought over control of Erbil, or Arbira as it was known in that period. After the 1st c. AD, Arbela became an important Christian centre. During the Sassanid period, Erbil was the seat of a satrap (governor). In 340 AD, Christians in Erbil were persecuted and in 358, the governor became a martyr after he converted to Christianity. A Nestorian school was founded in Erbil by the School of Nisibis in c. 521. During this period, Erbil was also the site of a Zoroastrian fire temple. Erbil was conquered by the Muslims in the 7th century. It remained an important Christian centre until the 9th century, when the bishop of Erbil moved his seat to Mosul. From the first half of the 12th century until 1233, Erbil was the seat of the Begteginids, a Turcoman dynasty that rose to prominence under the reign of Zengi, the atabeg of Mosul. Muzaffar al-Din Gökböri, the second dynast of the Begtegenid dynasty and a staunch supporter of Saladin, created a lower town around the city on the citadel mound and founded hospitals and madrasahs. Gökburi died in 1233 without a heir and control of Erbil shifted to the Abbasid Caliph al-Mustansir after he had besieged the city. When the Mongols invaded the Near East in the 13th century, they attacked Erbil for the first time in 1237. They plundered the lower town but had to retreat before an approaching caliphal army and had to put off the capture of the citadel. After the fall of Baghdad to Hülegü and the Mongols in 1258, they returned to Erbil and were able to capture the citadel after a siege lasting six months. Hülegü then appointed a Christian governor to the town and there was an influx of Jacobite Christians, who were allowed to build a church. 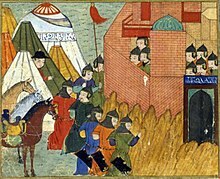 As time passed, persecutions of Christians, Jews and Buddhists throughout the Ilkhanate began in earnest in 1295 under Oïrat amir Nauruz. This manifested early on in the reign of the Ilkhan Ghazan. In 1297, after Ghazan had felt strong enough to overcome Nauruz' influence, he put a stop to the persecutions. During the Ottoman period, Erbil was part of the province of Baghdad, which was established in 1535. In 1743, the city was held for a short time by the Afsharid ruler Nader Shah after a siege lasting 60 days. An engraving from 1820 shows that at that time both the citadel mound and the plain at its southern foot were occupied. Mohammed Khor, a local Kurdish beg of Rowanduz, controlled Erbil for a short period in 1862. In 1892, the town had approximately 3,200 inhabitants, including a sizeable Jewish minority. During the 20th century, the citadel witnessed significant urban and social changes. A 15-metre (49 ft) high steel water tank was erected on the citadel in 1924, providing the inhabitants with purified water, but also causing water damage to the foundations of the buildings due to increased water seepage. The number of inhabitants gradually declined over the 20th century as the city at the foot of the citadel grew and wealthier inhabitants moved to larger, modern houses with gardens. In 1960, over 60 houses, a mosque and a school were demolished to make way for a straight road connecting the southern gate with the northern gate. Some reconstruction works were carried in 1979 on the citadel's southern gate and the hammam. In 2007, the remaining 840 families were evicted from the citadel as part of a large project to restore and preserve the historic character of the citadel. These families were offered financial compensation. One family was allowed to continue living on the citadel to ensure that there would be no break in the possible 8,000 years of continuous habitation of the site, and the government plans to have 50 families live in the citadel once it is renovated. In 2004, the Kurdish Textile Museum opened its doors in a renovated mansion in the southeast quarter of the citadel. The citadel is situated on a large tell – or settlement mound – of roughly oval shape that is between 25 and 32 metres (82 and 105 ft) high. The area on top of the mound measures 430 by 340 metres (1,410 ft × 1,120 ft) and is 102,000 square metres (1,100,000 sq ft) large. Natural soil has been found at a depth of 36 metres (118 ft) below the present surface of the mound. The angle of the citadel mound's slopes is c. 45°. Three ramps, located on the northern, eastern and southern slopes of the mound, lead up to gates in the outer ring of houses. The southern gate was the oldest and was rebuilt at least once, in 1860, and demolished in 1960. The current gate house was constructed in 1979. The eastern gate is called the Harem Gate and was used by women. It seems unclear when the northern gate was opened. One source claims that it was opened in 1924, while another observes that there were only two gates in 1944 – the southern and eastern gates. ornaments on the traditional house walls in the citadel of Erbil, Iraq. During the early 20th century, there were three mosques, two schools, two takyas and a hammam on the citadel. The citadel also housed a synagogue until 1957. The only religious structure that currently survives is the Mulla Afandi Mosque, which was rebuilt on the location of an earlier 19th-century mosque. The hammam was built in 1775 by Qassim Agha Abdullah. It went out of service during the 1970s and was renovated in 1979, although many original architectural details were lost. The door way of a traditional house in the Citadel of Erbil, Iraq. When it was still occupied, the citadel was divided in three districts or mahallas: from east to west the Serai, the Takya and the Topkhana. The Serai was occupied by notable families; the Takya district was named after the homes of dervishes, which are called takyas; and the Topkhana district housed craftsmen and farmers. A 1920 inventory showed that at that time the citadel was divided into 506 house plots. Since then the number of houses and inhabitants has gradually declined. For example, in 1984 4,466 people lived in 375 houses, whereas a 1995 census showed that the citadel had only 1,631 inhabitants living in 247 houses. Until the opening-up of the main north–south thoroughfare, the streets on the citadel mound radiated outward from the southern gate like the branches of a tree. Streets were between 1 and 2.5 metres (3 ft 3 in and 8 ft 2 in) wide and ranged in length from 300 metres (980 ft) for major alleyways to 30–50 metres (98–164 ft) for cul-de-sacs. The interior of a Traditional House in the Citadel of Erbil,Iraq. The perimeter wall of the citadel is not a continuous fortification wall, but consists of the façades of approximately 100 houses that have been built against each other. Because they have been built on or near the steep slope of the citadel mound, many of these façades were strengthened by buttresses to prevent their collapse or subsidence. There were circa 30 city-palaces; most of them located along the perimeter of the citadel. The oldest surviving house that can be securely dated through an inscription was built in 1893. The oldest houses can be found on the southeastern side of the mound, whereas houses on the northern perimeter date to the 1930s–1940s. Before the introduction of modern building techniques, most houses on the citadel were built around a courtyard. A raised arcade overlooking the courtyard, a flat roof and a bent-access entrance to prevent views of the courtyard and the interior of the house were characteristic elements of the houses on the citadel. 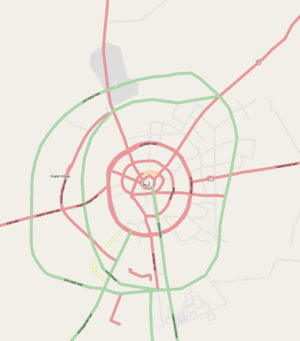 In 2006 and 2007, a team from the University of West Bohemia, together with Salahaddin University in Arbil, carried out an extensive survey and evaluation of the entire citadel. As part of this project, geodetic measurements of the citadel were taken and these were combined with satellite imagery, regular photographic imagery and aerial photographs to create a map and digital 3D model of the citadel mound and the houses on top of it. Geophysical prospection was carried out in some areas of the citadel to detect traces of older architecture buried under the present houses. Archaeological investigations included an archaeological survey on the western slope of the citadel mound, and the excavation of a small test trench in the eastern part of the citadel. A Neo-Assyrian chamber tomb was found at the foot of the citadel mound during construction activities in 2009. It was subsequently excavated by the local Antiquities Service and archaeologists from the German Archaeological Institute (DAI). The tomb was plundered in antiquity but still contained pottery dating to the 8th and 7th centuries BC. The cooperation between the Antiquities Service and the DAI was continued later that year with a further investigation of the tomb and with a small excavation nearby and geophysical survey of the surrounding area, in which also students from Salahaddin University participated. These investigations revealed the presence of architecture probably dating to the Neo-Assyrian period, as well as more burials belonging to subsequent centuries. In 2007, the Kurdistan Regional Government (KRG) established the High Commission for Erbil Citadel Revitalization (HCECR) to preserve and restore the citadel with the help of UNESCO. Among other things, the HCECR advocates the establishment of a zone extending up to 300–400 metres (980–1,310 ft) from the citadel in which building height should be restricted to approximately 10 metres (33 ft). This would ensure the visual dominance of the citadel over its surroundings. On 02 April 2019, NASA has described the historic citadel is possibly the oldest continuously occupied human settlement on Earth. On 8 January 2010, the HCECR and the Iraqi State Board for Antiquities and Heritage (SBAH) submitted the Citadel of Erbil to the Iraqi Tentative List of sites that are considered for nomination as World Heritage Site. The submission states that "The Citadel is today one of the most dramatic and visually exciting cultural sites not only in the Middle East but also in the world." Two further agreements between the HCECR and UNESCO were signed in March 2010, and it was disclosed that Arbil Governorate will finance the restoration project with US$13 million. The first restoration works were carried out in June 2010. The Citadel was inscribed on the World Heritage List on 21 June 2014. In January 2017, UNESCO indicated that the site could be removed from the list due to the slow progress being made in the restoration program. Some photos of the Citadel of Erbil during the resotration work, 2014. Citadel of Erbil during the restoration work in 2014. Hawler, Erbil, Iraqi Kurdistan. The wall of the Citadel of Erbil during the restoration work in 2014. Hawler, Erbil, Iraqi Kurdistan. A courtyard in a traditional house in Erbil Citadel. Ornaments and details in a traditional house in Erbil Citadel. A balcony in a traditional house in Erbil Citadel with ornamented hand-railing. ^ a b c d "Erbil Citadel - UNESCO World Heritage Centre". whc.unesco.org. Retrieved 30 August 2010. ^ a b c "History". www.erbilcitadel.org. Archived from the original on 19 April 2011. Retrieved 30 August 2010. ^ "Historical Evolution". www.erbilcitadel.org. Archived from the original on 6 April 2009. Retrieved 30 August 2010. ^ Qassim Khidhir Hamad. "The pride of erbil needs urgent care". www.niqash.org. Archived from the original on 8 May 2010. Retrieved 30 August 2010. ^ Ivan Watson. "Kurds Displaced in Effort to Preserve Ancient City". www.npr.org. Retrieved 19 October 2011. ^ a b "Mahallas". www.erbilcitadel.org. Archived from the original on 4 April 2009. Retrieved 30 August 2010. ^ "The Mosque". www.erbilcitadel.org. Archived from the original on 3 April 2009. Retrieved 30 August 2010. ^ "The Hammam". www.erbilcitadel.org. Archived from the original on 5 July 2009. Retrieved 30 August 2010. ^ "Alleyways". www.erbilcitadel.org. Archived from the original on 3 April 2009. Retrieved 30 August 2010. ^ "Perimeter Wall". www.erbilcitadel.org. Archived from the original on 4 April 2009. Retrieved 30 August 2010. ^ a b "Houses". www.erbilcitadel.org. Archived from the original on 9 March 2012. Retrieved 30 August 2010. ^ "ARCHITECTURAL HERITAGE 01". www.erbilcitadel.org. Archived from the original on 5 July 2009. Retrieved 30 August 2010. ^ "Urban Growth". www.erbilcitadel.org. Archived from the original on 9 March 2012. Retrieved 30 August 2010. ^ "The Citadel & The City". www.erbilcitadel.org. Archived from the original on 2 April 2009. Retrieved 30 August 2010. 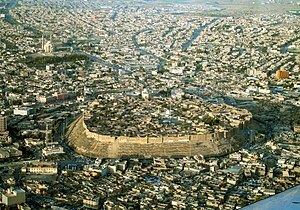 ^ "NASA: Kurdistan's Erbil Citadel oldest human-occupied settlement on Earth". Kurdistan24. ^ "History on a Hill". earthobservatory.nasa.gov. 1 April 2019. ^ Centre, UNESCO World Heritage. "Erbil Citadel". whc.unesco.org. ^ "Kurdistan's Erbil Citadel at risk of being removed from UNESCO World Heritage list". Ekurd.net. Retrieved 18 February 2017. Nordland, Rod (October 10, 2017). "After 6,000 Years of Human Habitation, One Family and Lots of Mice". The New York Times. ISSN 0362-4331. Wikimedia Commons has media related to Citadel of Erbil. This page was last edited on 5 April 2019, at 15:32 (UTC).